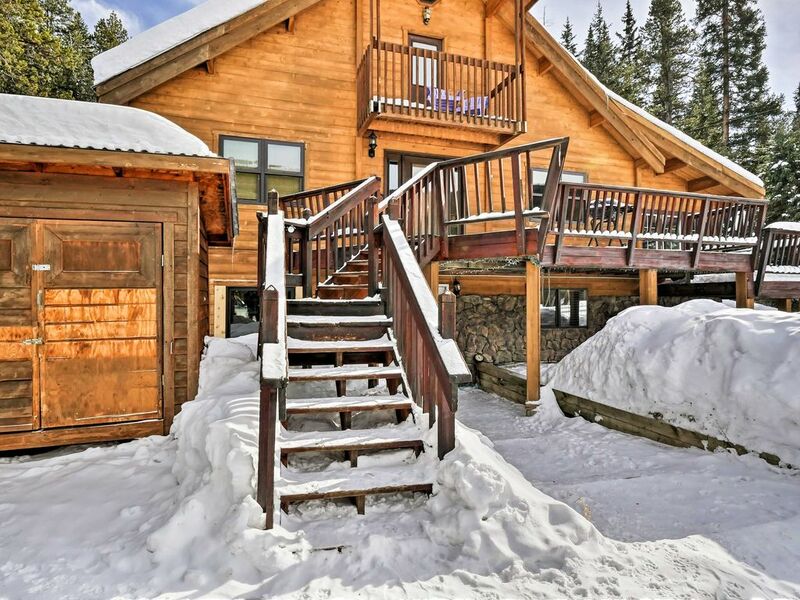 2BR +Loft Breckenridge Cabin w/Mtn Views & Hot Tub! Summit County has earned the name “Colorado’s Playground” due to the variety of exciting recreational activities available in the area year-round. From mountain biking and hiking through stunning scenery in the summer, to world-class skiing on snowy white slopes in the winter, Summit County Colorado has something for everyone, no matter the season! Let this inviting 2-bedroom, 2-bathroom cabin with space for 8 and an extra sleeping loft be your perfect alpine accommodation! This beautiful property offers a rustic ambiance and a cozy living room with a pot-bellied stove sure to enhance your mountain living experience. The home was upgraded in 2018 with brand new windows, bedding, towels, furniture, and some cosmetic updates. Even the kitchen boasts new dishes and utensils! In the summer, you and your guests will love relaxing on the large deck where you can take in the beautiful view of emerald pine trees and impressive mountain peaks. In the winter, soak in the steamy private hot tub to rest your muscles. This bright, modern kitchen is a wonderful place to cook and enjoy your favorite meals. Plus, it has quick access to the deck, making it easy to use the grill. To relax at the end of the day, curl up by the toasty fire and rest up for your next day of Colorado mountain adventures! From this mountain home, you’ll be able to take full advantage of all the amazing activities Summit County has to offer. Keystone, Arapahoe Basin, Copper Mountain, Breckenridge, and Vail are all nearby, so you can enjoy exploring different resorts and towns. In the summer, you’ll have easy access to hiking and biking trails, watersports on Lake Dillon, as well as a variety of other activities. No matter the season, Colorado’s Playground has something for you! - Amenities include a fully equipped kitchen w/ stainless steel appliances, private hot tub, free wifi, an open concept layout, mountain views from the back deck, charcoal grill, fireplace, and more! The property was perfect for our party of 6 + dog. My only minor complaint is that the window to the central bathroom seemed to be broken in an open position, so it got quite chilly when showering in that restroom. There was ample room for lounging, gathering to eat, and plenty of comfortable bedding options. The property and location we're also great I highly recommend this rental. Roomy cabin for 8 people. Short 10 minute ride from Breck. Modern appliances. Shower pressure was a bit weak, but we're not picky. Hot tub was a great temperature. Modern kitchen appliances. Never heard a peep from the people downstairs. Would recommend to people looking for an affordable place to stay near the ski resorts, and not looking for anything fancy. Hosts were super communicative! Incredible location for mountain access. Overall our stay was enjoyable. We only needed the cabin to sleep and eat, otherwise we were on the mountains. I've emailed the property owner of some minor issues we encountered so they can be addressed. It's a five star location for sure if you want to be out of tourist town. I stayed here last week with 2 of my girlfriends and we had a wonderful time! There are people living on the bottom floor but other than the cars in the driveway we never would have known they were there they were so quiet. The house was so clean, comfortable and spacious! The hot tub felt great after a long day of hiking! At night we could see the entire milky way and every other star imaginable! Thank you for such wonderful accommodations! The photos make this place look like a steal but I'd say the value is in the "normal" rating. It's also not obvious that there's a couple folks that live in the first floor. It's completely seperate and they were very courteous and no bother, but could be a surprise if you didn't realize it. Location is convienent as it's pretty close to town yet also close to some nice trials. McCoullough Gulch was an awesome trail not to far away. Since the town of Breckenridge pre-dates the ski area by 102 years, the place blissfully lacks a master-planned feel and has authentic, historic, small-town charm. You may feel away from it all tucked in the White River National Forest in Breckenridge, but you are really in the epicenter of Colorado's best! You are within 30 minutes from 5 other major ski areas: Vail, Keystone, Arapahoe Basin, Copper Mountain and Loveland!! Plus, the huge shopping center Outlets at Silverthorne are a mere 20 minute, stunningly scenic jaunt! In and around Breckenridge, a pervasive network of historic mining trails offer fabulous chances to explore the valley on a mountain bike, a dog sled, snowmobile, cross-country skis, snowshoes or even feet! Other surprisingly year-round activities include fishing, museum and historical sites tours, hot air balloon rides and mine tours. You can get private, guided tours on virtually any activity imaginable! During summer, climb a nearby 14er (14,000+ foot mountain) at Quandary Peak. Bike rental shops will point you to the paved bike path along the Blue River stretching for miles of scenic beauty on the way to Frisco. From Frisco you can bike to Keystone, around Lake Dillon and even to Vail Pass! Breckenridge is serious about summer fun with the Gold Runner (raised rail) Alpine Coaster, hit howling speeds on the famous Alpine Slide, plus take scenic chairlift rides, pan for gems, go bungee jumping, play miniature golf, go white water rafting and take a 4x4 off-road tour! Did you know The Town of Breckenridge owns a Jack Nicklaus-designed, 27-hole golf course? Not only have numerous national and regional honors have been bestowed on the course, but the golf ball flies farther and straighter than at lower elevations, since there is less air resistance. As summer wanes, taking a drive on Boreas Pass Road during the fall is one of the best places to see fall color in the Colorado �� perfectly timed to be the weekend of OktoberFest! Don't miss Breckenridge's many fun and wacky festivals throughout the year! Despite the appreciation for preserving the old town area, massive ski area improvements continue to enhance the skier experience at Breckenridge. With a new bridge, now you can ski right down to Main Street to Colorado’s largest and best-preserved historic district. The Breck Connect Gondola is right next to the free bus depot, which loads in the middle of the parking lot! Breckenridge banished the death marches schlepping gear!! You'll find everything from steep, above-timberline chutes and bowls to groomed greens and everything in between. There are five terrain parks and half-pipes for skiers and boarders, with the terrain park called “Freeway” rated as one of the best in the United States! Truly world-class cuisine awaits at many of Breckenridge’s 60 restaurants, plus a vibrant arts scene, numerous spas, and over 200 stores. Downtown Breckenridge shops offer everything from extravagant to oddball. Don’t forget - if name brands are your thing, the expansive Outlets at Silverthorne are only minutes away. Breckenridge somehow blends the indulgent with the funky and friendly that make this town a must-see (and do) for ANY season!